Aquarius teaches lifesaving and survival skills to swimmers from 9 years old, through the RLSS’s SURVIVE and SAVE programme, to ‘safeguard lives in, on and near water’. Survive and Save has been developed by the Royal Life Saving Society UK to address the current drowning environment. The programme includes an increased focus on self rescue and survival skills to tackle and identify area of risk. The Survive and Save Lifesaving Awards are a suite of progressive awards that teach personal survival, rescue, sport, fitness skills and knowledge to swimmers of 12+ years. The awards are structured into three levels, Bronze, Silver and Gold and four awards are available at each level. 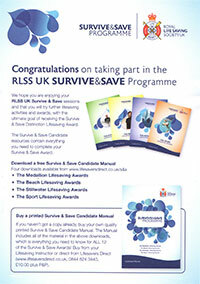 Use this link to download the Survive & Save manuals saving yourself £10!!! Each level is a core element which must be completed before an Award Strand can be taken. The structure ensures a candidate gets the broadest of skill bases, and finally it all leads to the DISTINCTION AWARD, which is automatically awarded to candidates who show the highest level of Lifesaving skill by achieving three Gold awards within 24 months. NATIONAL POOL LIFEGUARD QUALIFICATION — Aquarius has adopted the training of this national professional qualification to run concurrently with Survive and Save, focussing on the exam during the final term around a candidates 16th birthday. To find out more, contact us on 01342 459 371 or 01883 344 662 or info@aquariusswimming.co.uk. As a part of continuous professional development our staff undertake pool and dry side lifesaving training. I recently attended the Aquarius SC run NPLQ course. It was a one week intensive course and I feel that it has taught me invaluable lessons that I will keep with me for the rest of my life. The course was well structured and gave great focus on the key elements of the role of a lifeguard. Each day we started with a re-cap of the previous day and continuously consolidated our learning of both the theory and practical skills. I found the good balance of theory and practice each day very useful in achieving my aspiration of becoming a qualified lifeguard. Within a week of passing I had secured my first job interview as a pool lifeguard at a prestige leisure centre in London. The interview was both group and practical based. Before the end of the interview I was offered the role on the spot. The hiring manger was so impressed with the quality of my training, she told me it was the best practical interview they had ever seen. Thanks Aquarius SC for the high level of training you gave me, I am now a qualified lifeguard, fulfilling my career aspirations at a fantastic leisure centre.